Streamline Purchasing ~ subscribing to a CSA or growing food yourself saves time and transportation resources. If you do shop the market weekly, make a list and stick to it. Prepare in Batches ~ Chop ingredients that get used often (like onions and garlic) in large batches and save in the fridge. Double stock, puree, and sauce recipes and freeze the remainder. Make extra rice, mashed potatoes, and lentils for reusing in the following night's lunch or dinner. Double pancake, waffles, stuffed shells, enchiladas, etc. to freeze. Make one big batch of beans in the pressure cooker and use them in salads, sides, and lunches for the whole week. 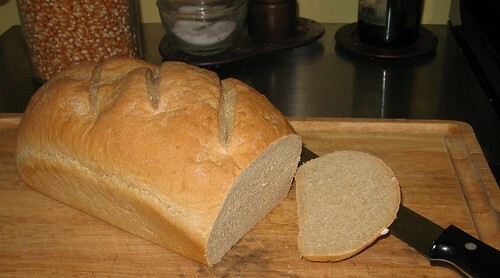 Practice ~ Making your first loaf of bread from scratch seems to take all day. As you bake more often, the process will become so second nature that you suddenly think it takes now time at all. So it is with other cooking methods. 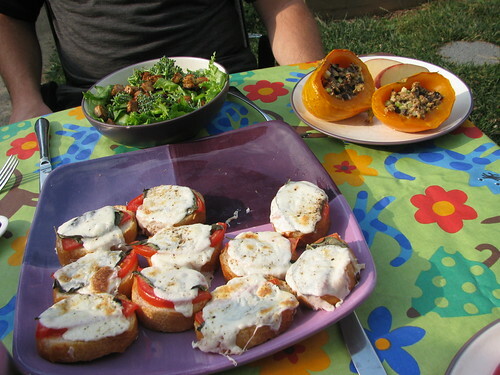 Cook Simply ~ Every meal does not need to include multiple cooked courses. In fact, it is often healthier to have simple fresh foods. Typical dinners at our house include a protein, starch (often baked alongside the protein or leftover from big batch cooking), and fresh salad or fruit. Make Cooking Fun ~ Put on some music. Include the kids. When you re-frame cooking as a hobby instead of a chore, suddenly it becomes easy to carve out more time. Eat Well ~ We eat together for two - three meals a day. This is our family reconnection time. We talk about where the meat comes from, what's fresh from the garden, and the pertinent parts of our day. Acknowledging the source of our foods creates an atmosphere of reverence and enjoyment. Cleanup ~ With all the cooking, dirty dishes are endless here. I myself could use some help keeping up. The best idea I have is to let go of the feeling that your house must be perfectly clean. Build in a routine for picking up the clutter and loading/unloading the dishwasher. A lived in house will never and should never look clean all the time. How do you make time to cook well?